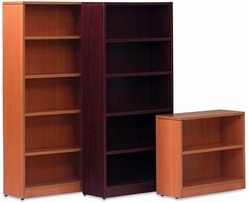 Hale Wood Bookcases are an industry standard. American made in Herkimer, NY, they are available in many sizes and finishes. Hale has been making high-quality, value-priced bookcases for over 75 years. Metal bookcases offer superior value and durability. All of the metal bookcases Office Furniture Concepts offers are commercial grade quality and available in many sizes and colors.